In the study: 10 Steps to Improve Major Gift Fundraising, one of the key lessons learnt was that donor retention is more important than acquisition. Heather Joslyn goes on to explain in her article Cultivating Former Donors Helps Small Charities Raise Major Gifts how stewarding their big-gift donors pays off more than soliciting new prospects. Josyln writes: Surveying charities with less than $10 million in donated annual income to find out which factors enhance major-gifts fundraising, researchers found the groups lost an average of $300 for every prospective major donor solicited. By contrast, the organizations raised an average of $2,200 for every existing major donor they were stewarding. 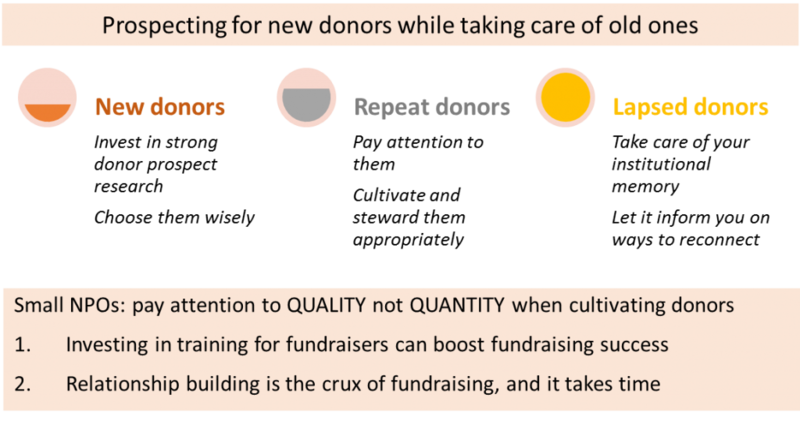 The takeaway, says Amy Eisenstein, a co-author of the study: Small nonprofits need to pay more attention to quality, not quantity, when cultivating donors. Ms. Eisenstein, author of the book Major Gift Fundraising for Small Shops, conducted the study with Adrian Sargeant, director of the Centre for Sustainable Philanthropy at Britain’s Plymouth University, and Rita Kottasz, a research consultant to the center. They surveyed 662 organizations that generated income of under $10 million. Just over half the groups raise less than $1 million annually. The researchers found no evidence that any particular measurement, such as tracking dollars raised or solicitations made, was linked to overall fundraising success. However, professional development for fundraisers did help, with the strongest links found at organizations that sent staff members to major conferences or supported study in formal fundraising courses or credential work like the Certified Fund Raising Executive, or CFRE. Yet these types of training appear to be offered sparingly. The study found that only 11 percent of groups supported formal coursework (such as through a local university), though 56 percent said they provide workers with online training and webinars. Major-gift officers or development directors, the researchers found, raised an additional $37,000, on average, for every additional form of training acquired. Even taking a webinar helped, Ms. Eisenstein says. The study also unearthed a finding that argued against the job hopping that’s rife in the field, she says. “The longer development directors were in their position, the more they raised,” says Ms. Eisenstein. For each additional year fundraisers were in their position, they secured more than six additional major gifts. Charities have varying definitions of “major gift.” For groups in the survey raising major gifts, the average donation was $24,555, while the median gift was $5,000. Major gifts made up an average of just under 14 percent of respondents’ overall donated revenue. This articles was first published in The Chronicle of Philanthropy on 4 November 2015 and republished on this site with permissions. Click here to access the original article.